From watching the trailer, Dogs on Netflix comes off a saccharine – a series of heartwarming tales centred around man’s best friend. But after watching all six episodes, heck even after the first 20 minutes, Dogs reveals itself as an entertaining documentary series about just how powerful the human/canine bond can be in times of turmoil. Created by former criminal prosecutor Glen Zipper and his producing partner Amy Berg, Dogs is life affirming at best, and also another opportunity to have furry four-legged friends command your attention for an hour at a time. Each episode follows a different individual or family, and the challenges they face. The first episode follows 12 year-old Corrine as she deals with the constant presence of epileptic seizures that leave her unable to breathe. The episode follows the countdown to the family bringing home Rory, a golden Labradoodle service dog, who’s been trained to detect seizures through smell – the idea being that Rory would be able to alert the family if Corinne was seizing in the middle of the night, unable to call for help. The second episode, titled Bravo Zeus, follows Syrian refugee Ayham as he struggles to reunite with this Husky Zeus; making elaborate and dangerous plans with a trusted friend in the hopes of being reunited with his trusty companion. Without going into any spoilers, each episode is a beautiful rendering of companionship and how—when a dog is your only family left in the world—you’d do anything to rescue them from harm. Knowing the level of quality Netflix dedicates to its original content, I was expecting Dogs to look good, just not this good. The shot composition is wonderful, and the level of visual storytelling is fantastic. I was really worried about the over-reliance of interview footage, with the human subjects telling us how important the dogs are. 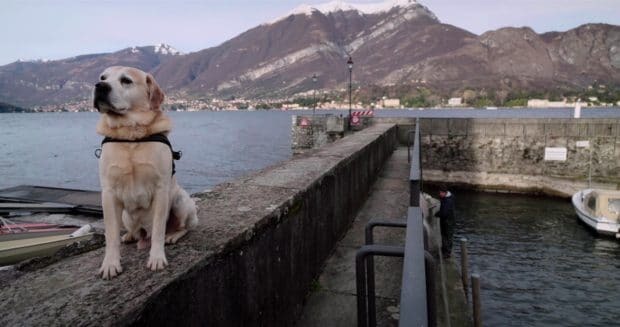 Thankfully the camera does most of the work, whether it’s watching Ayham scroll through Facebook discussion groups that might reveal information on Zeus or the simple quiet of Italian fisherman Alessandro and his golden retriever Ice, skipping across the waters of Lake Como – Dogs is beautiful to look at. Each episode has a distinct visual style that matches the narrative it’s trying to tell. It’s clear that aesthetic was just as important as the story, something I truly appreciate. It would have been very easy to just have the cameras follow the dogs, ascertaining a sort of cute factor throughout (which there is). But Berg, Zipper and the directors spend just as much time on exploring the worlds in which the human counterparts inhabit, and the loneliness that often comes with their furry companions absence. Of course Dogs is emotionally manipulative. The subject matter—dogs and the ties that bind—is emotional as hell, but the six episodes never revel in it for the sake of your tears. Each episode is emotionally resonant because of how relatable the stories and relationships are, not just because it’s cute dogs running around for 60 minutes. In an era of media saturation, cynicism and hate watching are almost the starting point, so it’s refreshing to watch a show that delves into life affirming reasons humans have been connected with dogs for thousands of years. No, Dogs probably won’t win any award, and in an era where every movie or show is gunning for acclaim, it doesn’t need to. It’s a show that, in my mind, exists as a reminder that we all need companionship in our lives – the last episode, focusing on dog adoption advocate Anna, is a great example of this. She drives—by herself—dozens of shelter dogs from Texas to New York to be with their new owners. Overall, Dogs is an effecting documentary series that sometimes borders that never borders on cheesy or overly emotional. And even if it did, are we so cold hearted as to pillage such a show for existing? It’s the perfect show to curl up and watch when the weather outside is awful and things in our own lives seem worse than they could be. Dogs reminds how tough things could actually be, and how much easier those situations can be having a furry friend in tow.